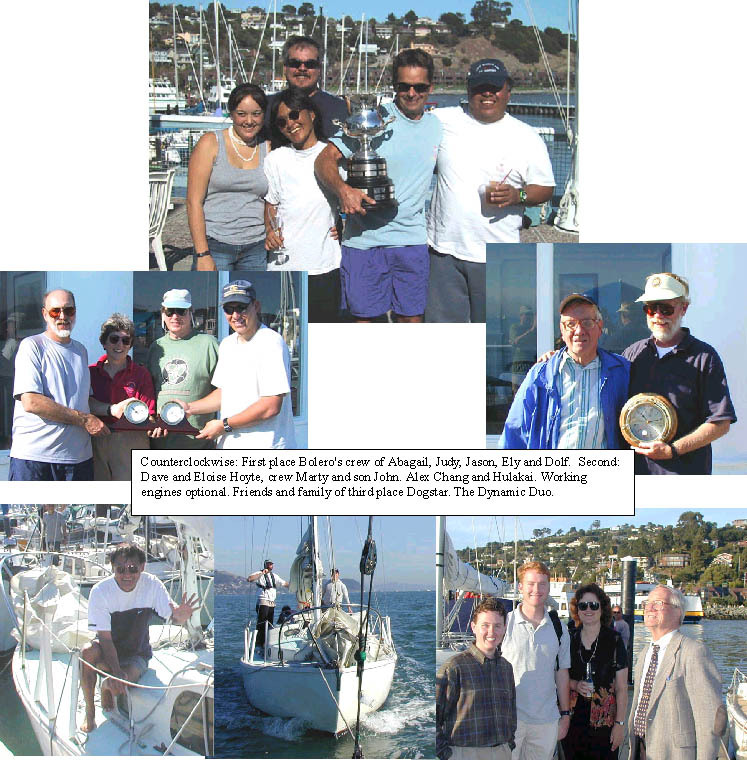 The (inter)National Triton Regatta held September 29- October 1 at the Corinthian Yacht Club was a blast. Six crews raced on the Knox Course for the National Trophy over three of the most beautiful days you'll find on theBay. Sunny skies, a strong flood and moderate to brisk breezes characterized the series... unless you sailed into the hole on the last race. In addition to local crews from Sleepyhead, Bolero, Captain Hooke and Dogstar, were defending (and multi-time) National Champ Dave Hoyt's crew from the Chesapeake and Gary Everingham's crew from Canada. Eight boats were available for the race; the four above as well as Jim Bartlett's Windswept, Alex Chang's Hulakai and reserve boats Mike Borgerding's Viking and Pat and Ann Gilleran's Never Mind. 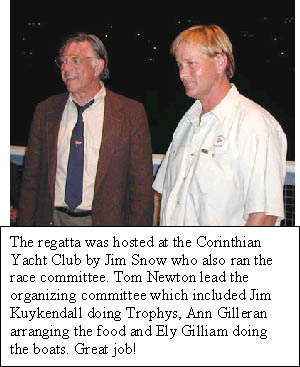 Jim Snow, who arranged for the regatta to be held at the Corinthian Yacht Club also headed the race committee, CYC provided the race committee and donated the use of the inflatable that transfered the crews between boats as part of the round-robin format. Thank you once again Jim, and thank you CYC for your hospitality. As expected, the main battle for the trophy was between Dave Hoyt's Chesapeake crew and Ely Gilliam's crew from Bolero. 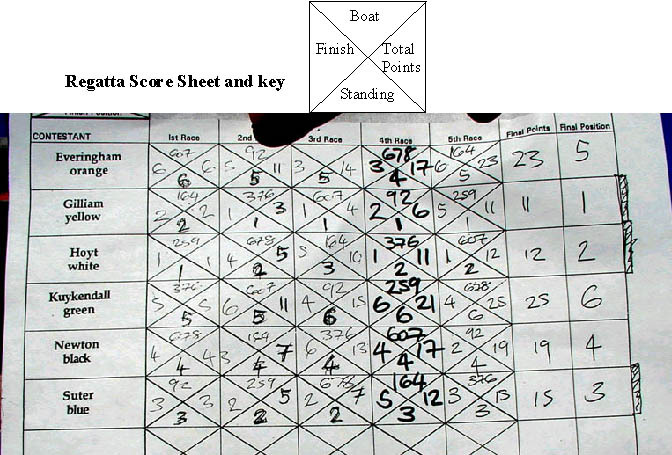 As the score sheet shows, Hoyt's crew finished 1, 4, 5, 1, 1 while Gilliam's finished 2, 1, 1, 2, 5. With a five point lead going into the last race, team Bolero found a way to make it a nail biter. 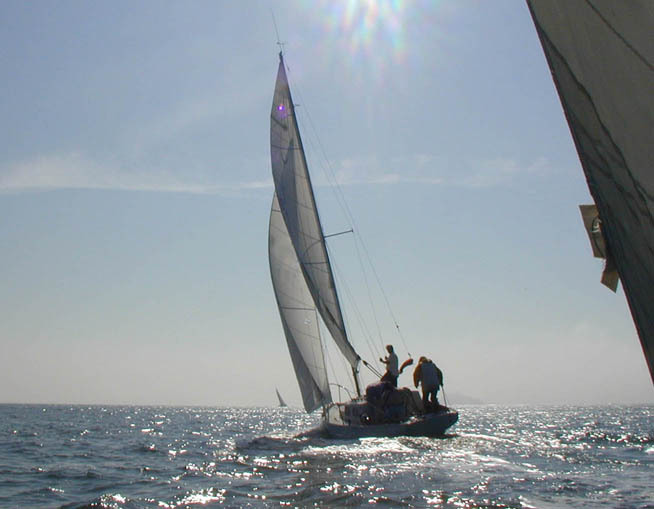 Leading the fleet, they followed the winning strategy of the previous four races; long port tack toward Yellow Bluff to minimize the effect of the flood. This time they lead the fleet into a hole. The boat's further back escaped, including Hoyt on Dogstar. Rumor has it that Ely's crew, on Captain Hooke, could see jellyfish swimming circles around the Hookster. In the end they inched past Everingham's crew to take a fifth and win the regatta. Had they finished last they would have been tied with Hoyt and the fate of the Trophy would have been up to the Florida Election Commission. And to the amazement of everyone, Dogstar's crew came in third, without ever once successfully flying a spinnaker (they did send an empty halyard up once). None of us really understands how this happened, but thanks to all the crew reps who gave us so much help.